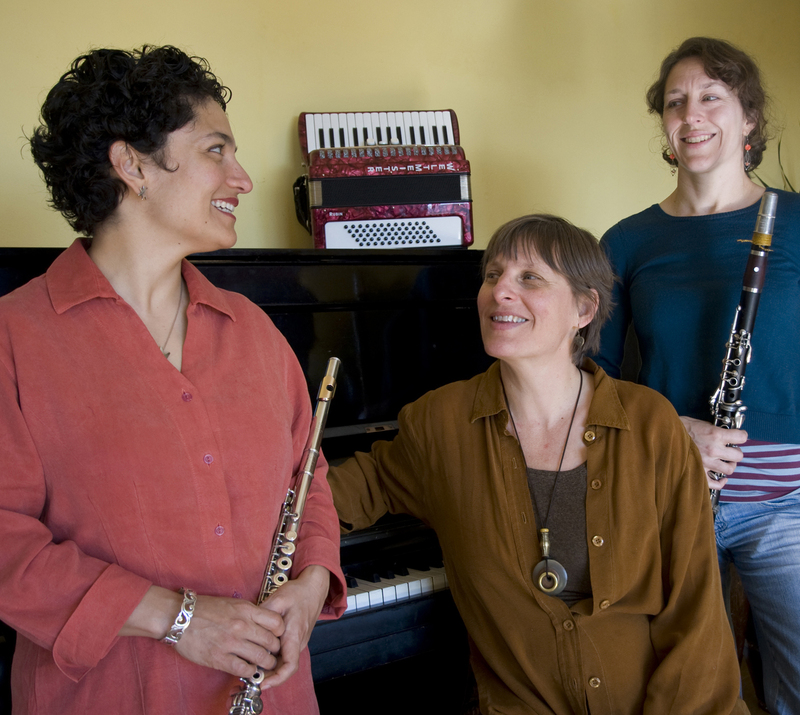 The Bernal Hill Players are, from left to right, Martha Rodriguez-Salazar on flute and voice, Jennifer Peringer on piano, and Leah diTullio on clarinet. Photo by Mabel Jiménez. In case you didn’t know, this world has long suffered from a shortage of songs suitable for a clarinet, flute and piano ensemble, and the Bernal Hill Players decided to do something about it. The newly commissioned works for their trio will be performed tonight at 8 p.m. at the Community Music Center. The evening’s work represents efforts that began two years ago when Jennifer Peringer on piano and Martha Rodriguez-Salazar on flute, both music teachers at the Community Music Center, decided to start playing together and invited fellow performer Leah diTullio to join them on clarinet. As “three women living in San Francisco in the 2000s” they had to ask themselves what they wanted to play, said Rodriguez-Salazar. They decided they needed to commission pieces that would reflect their personal style and influences of classical, folk, bluegrass and Latin music. They got a grant, Subito, from the San Francisco Bay Area Chapter of the American Composer’s Forum, which allowed them to commission new works. From the beginning they knew they wanted to work with local composers. This also allows the performers to collaborate with the composers. “They can say … I didn’t like how that sounded, maybe I should just change it, or do you like how this sounds,” said Rodriguez-Salazar. “You can still have a relationship with a dead composer … but when they’re right there with you it’s wonderfully final,” added Peringer. Aside from music that was inspired by the group’s musical influences, they wanted something with a distinctive local feel. “I know that there’s people out there who are searching for a way to feel more in touch with their neighbors and with their community,” said Rodriguez-Salazar. The fruits of these efforts will be unveiled Saturday, when the Bernal Hill Players will perform a combination of works from recent years, as well two world premieres. Aside from the regular flute-clarinet-piano combination that is the basis for their work, listeners can expect to also hear guest performers and additional instruments like accordion, drums, and even a big dried leaf being shaken about for musical effect. One piece featured on Saturday’s program is the Bernal Heights Suite, a piece by prolific composer Beth Custer. In keeping with the Players’ idea of local-centric, all the lyrics are “a list of all the plants you can find on Bernal Hill,” said Rodriguez-Salazar, who will perform voice for the piece. The Suite de los Barrios is a brand new work composed by Chus Alonso, a Spanish-born composer and fellow teacher at the Community Music Center, who creates music with jazz and flamenco sounds. The Suite portrays music that is reminiscent of different neighborhoods in San Francisco, the Mission, downtown, and the Pacific waves. The Bernal Hill Players will be performing their show, San Francisco: In and About the City, this Saturday April 10th at 8:00 p.m. at the Community Music Center on 544 Capp St., and on Saturday May 15th, 8:00 p.m. at the Red Poppy Art House on Folsom and 23 streets. Both shows are priced at $15/10. Mabel Jiménez is a freelance multimedia journalist and photographer who studied Photography and Journalism at San Francisco State University. She can't stay very long in one place and will gladly take an assignment almost anywhere in the world, especially if it's shooting for NGOs/non-profits.